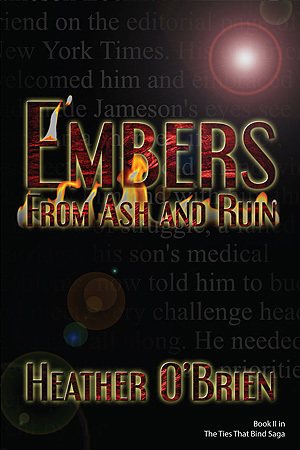 Embers From Ash and Ruin ~ wages war against the demons of regret and deceit. Nearly two years have passed since the events that upended the Grant family. Still struggling with the pain of losing their youngest and dearest sibling, Jordan’s brothers press on as best they can. Ben resumes composing from his backyard studio in sunny Key Biscayne, Florida. Chris is less fortunate. Isolated from his former bandmates and struggling to maintain the façade of his unhappy marriage, he has yet to let go of the fateful events surrounding Jordan’s murder. The official story is as convenient as it is contrived. Questions linger that police cannot—or will not—address. What were Jordan and Farin doing at Bobby Lockhardt’s Coral Gables home that afternoon? Could a failed burglary account for the tragic turn of events? Was Farin’s mysterious automobile accident three days later mere coincidence? Reporter Miles Macy’s obsession with connecting the dots has landed him a forced relocation to Chicago, but distance has not curtailed his private investigation. Having gained a certain reputation from his accounts of the ups and downs in Farin Grant’s tumultuous ride to stardom, Miles feels inexplicably tied to the late songstress. His gut points him in a singular direction: Jameson Lockhardt. Meanwhile, Lockhardt Sound, Inc. has seen better days. Once the leader in an ever-changing industry, LSI has suffered under the loss of its three biggest commodities. Pressure mounts from all sides as the “Big Six” gobble up vulnerable labels. Jameson’s inside source at Miami’s Metro Dade PD has become greedy, and careless. Worst of all, a Windy City reporter speculates on events the mega-mogul must keep buried. Left with little more than creative accounting and a grass roots strategy, Jameson struggles to bring his failing enterprise back to black in time to avoid a buyout. He must retire a success and hand Bobby his rightful legacy. After spending his entire career covering a life of criminal activity, he will go to any length to ensure no one puts him off course. When an innocent request from a former colleague leads to a true confession, a life and death race begins. Only one man can bring light to the darkness of Lockhardt’s past. And time is running out.